I have a confession to make. This recipe is blatant thievery from a restaurant in Manhattan that you will probably never go to (although it is very good). Patroon is one of those swanky, masculine, “steakhouses” that were all the rage in the booming ’90s. I happen to eat there quite a bit because it’s the nicest restaurant closest to our New York offices—so it’s a great place to take Important People to lunch. It’s not trendy or cool. It’s just good with good service, so it’s almost always full of Men in Suits and a few Ladies (and then there is me, but they are very nice to me; in fact I think they wish I would eat there more often, and I would if they would put more organic food on the menu!). I tested this salad on my family a few weeks ago, and I knew it was a hit when Eve looked down at the salad bowl and thought for a moment and then said: “It’s a BLT!” with utter joy. There were no leftovers. 1. Cook the bacon until crispy. 2. Chop 1½ of the tomatoes, and squeeze the pulp of the other half of the second tomato into a bowl for the dressing. 3. Cook up the croutons by cubing the bread and dousing in olive oil and baking them or sautéing on top of the stove. 4. Clean the lettuce and sort into bowls—this recipe will make 4 largish salads. 5. Add the chopped tomato. 6. Crumble the bacon on top. 7. Mix the dressing ingredients together—emulsify with a fork or a whisk. Then add the dressing on top of the salad. 8. Top with croutons and serve. You can pretend you are eating at Patroon by asking your family if they would “like fresh ground pepper with that” in a French accent. 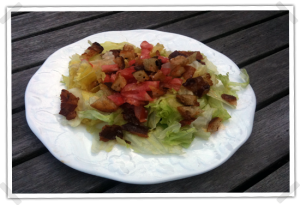 2 Responses to August Salad: BLT Salad! Salad, so hard to get my family to eat salad. We grew up with a salad at every meal, yet my kids have little interest. But if there’s bacon on it, my younger son just might eat it! Definitely going to try this with my wonderful organic tomatoes that are thriving in Rodale Institute compost! 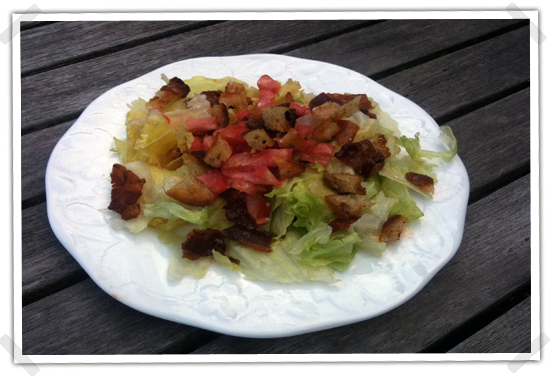 I made a BLT salad last year, though I hadn’t heard of this. My Dad is 81 now and has a hard time eating BLTs because of the way his teeth no longer line up properly. I just used toasted bread cut into cubes and miracle whip thinned with milk for the dressing, but it was still very good !